A funny thing happened a couple of days back. Man : Do you have face cream? SA : Yes sir. Which one do you want? Man : (looking around vaguely) Just anything….any plain face cream for men. SA : (Dumping a few brands on the counter) Take this, Emami skin cream. Man : (giving an embarrassed laugh) No no. I don’t want fairness cream. I just want any normal skin cream. Man : (Taking a look at the Garnier box ) I said I don’t want fairness creams. I don’t intend painting my face white! SA : Sir , we have just these two and Vaseline. Man : Give me Vaseline. Man : Oh No!! Yeh bhi whitening?!!! Don’t you have any normal cream?? HL : Why don’t you try Vicco? Man : Vicco?? Isn’t that a toothpaste? 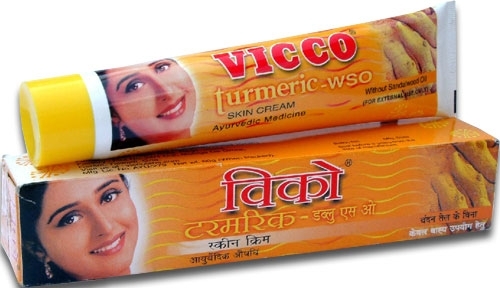 SA : (Placing a tube of Vicco turmeric on the counter) You can try this Sir…very herbal, good for skin. By this time, even I was quite piqued by the array of face creams. Me : (to SA) Whats this “WSO” in this cream? SA : Its for “Without Sandalwood Oil”. Man : …And, how does that help? SA : No idea sir. But regular use of this cream will make you fairer. The turmeric is for fairness. Man : AAAARRRGGGHHHH!! Isn’t there just one simple cream that I can use?? How about Nivea?? SA : Sorry sir, we are out of stock. Me : (taking serious pity on the guy’s plight) Why don’t you try Boroline? SA : Yessir. Very nice fragrant cream. SA : (laughing ) He he!! Why you need fairness cream sir?! You are already very fair. SA : Ohh sorry, you don’t want fairness cream!! But we get demand only for whitening creams sir…thats why we have to keep it. Everyone wants to become fair now! He he 😀 !! Man : (paying for the tube of Boroline and turning to me) Thanks. Me : You are welcome. The man left the store, but I was left with many a questions in my mind. Firstly, why indeed are Indians crazy about becoming ‘white’ ?? Why do movie stars, who are already fair, have to endorse fairness products? Do they really believe in the product? Are they aware of the psychological impact their actions have on millions?? Do they feel accountable for what they do? Why do men have to look pretty ALL the time?? Is it a crime if they sweat at a game of tennis?? Why do women have to be white ALL OVER?? Earlier it used to be just about the face. Now they’ve gone into regions which are best not mentioned 😐 !! A long time back, when we were looking for proposals for my sisters, I remember guffawing at the “wanted brides” section. “Tall, fair, convent educated….” , went the requirement list. Some people, who wanted to clarify that by fair they didn’t means the bride’s sense of justice, would word their requirements as ,”Tall, gori, convent educated….”. “You know Dad, going by this list, I will never get married through the arranged marriage system 😦 ” , I once confessed to Pop. It wasn’t so funny when we had people coming over to our place and then rejecting my sisters because they didn’t find them fair enough! For the record, one of my sister is just short of being milky-white and the other was fairer than the term “wheatish”. In such demands of ‘white’, what hope did I have? Luckily, the BF (who is around 8 shades lighter than me) never bothered about the colour of my skin. Just as well 🙂 …it isn’t even a topic of discussion between us…has never been!! My sisters finally got married to men who saw beyond their skin colour. I’m glad to say, they have perfect spouses (touch wood). Conversely, my bhabhi (who is around 15 shades lighter than my brother) never bothered that Bro was three shades lighter than Rajnikant! All my siblings had arranged marriages. They all get along fabulously with their spouses. And I’m sure, none of them would ever, EVER suggest the other to use any kind of so-called skin whitening products. The people who use these creams are the impressionable youth. It is used by youngsters fresh out of college or young men/women available on the marriage market. It is used by young men who are advised that girls are attracted to only the fairest amongst them. Young girls use it believing that the same expectations rise from the guys. It is used by youngsters who are easily influenced into believing that to achieve ANY success in life, they have to look fair. That employers are more impressed with their glowing looks than their capabilities. Every time such an advertisement played on the telly, I would have a sinking feeling in the pit of my stomach. My kids are not fair, but given the societal expectations, I’ll have a tough time helping them build their personalities without worrying about the color of their skin. I’m already mad at that unknown person who put it in Lui’s mind that she is not fair enough and if she wants to be, she needs to use a ‘fairness cream’. So every time those dumb ads come on screen, my daughter demands that I buy her that very cream because she needs to become fairer. Any amount of counseling on the lies perpetrated by those ads, falls on deaf ears. “Woh aunty gorey-gorey ho gaye na. Mujhe bhi hona hai”, is her stubborn claim. Keeping the telly switched off around the twins is the best option possible. Though this is a serious reason for concern, I don’t blame the men for wanting to look good. Women have been at the receiving end of being psyched out into believing that they are the ugliest, fattest, darkest damsels on the planet. Clever money-making manufacturers of fairness products have just shifted the focus on to the men now. The men have, unfortunately, bitten the bait 😦 . If the above news reports on Indian male cosmetics market is true, then what can I say guys?! Anyhow, to end this post, I would like to say that I personally know a couple of girls who used skin whitening creams right before their marriage (as insisted on by the in-laws/family members) and ended up with severe skin rashes. Believe me, their wedding snaps weren’t very pretty 😐 . The only way to reduce the usage of these harmful products is to spread awareness. 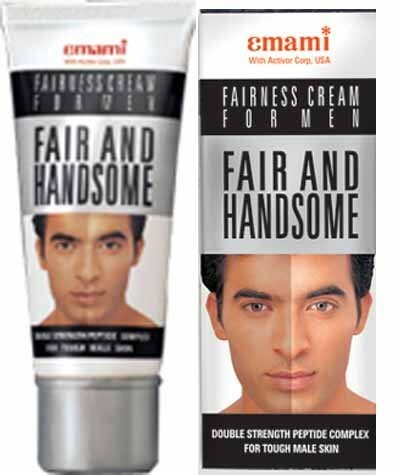 If you see people around you using them, ask them politely why they want to use a fairness cream. I tried it with the nanny. She was flustered for a minute, then sheepishly admitted that she thought she would look fairer. I asked her then if she has found any difference from before. As expected her reply was a simple ‘No’. I then told her to stop wasting her money on it and she hasn’t used it since. Believe me, she looks much better now 🙂 . I only pray that this fetish for ‘fairness’ dies a natural death one day, preferably before my kids hit puberty !